I found the shop manual woefully inadequate for this task and hope to share the results of my trial and error with others. To get a decent repaint it is necessary that the outer rubber seal at the top of the door be replaced. This is pretty straightforward; just drill out the rivets and reinstall with a pop rivet gun, but remember to use short stainless rivets or you run the risk of denting your door skin from the inside out! Some early MGBs have a removable window stop (the small metal 'box' in the door bottom that the lowered door glass rests on, originally topped with a horsehair pad). If you are so lucky, just unbolt that and lower the glass to uncover the rivets. Later cars had this door stop welded in place and the only solution is to remove the door glass. The following is the procedure that I found, through trial and error, worked best on my 1974 convertible. Earlier or later cars may need a different approach. Wind the door glass down halfway with the handle. Unbolt the rear channel top and bottom and fish it out of the door. Remove the 4 regulator bolts from around the winder knob and the 3 short regulator bolts from the center of the door. Carefully push the winder knob mount on the regulator into the door and lower the regulator, with the glass attached. Push the glass as far back in the door as possible and tip the front edge of the glass up. Pull/slide the roller pins on the regulator out of the window channel (there is a slot in the middle for the front roller to fall through). This may require some wiggling around. Remove the glass from the door. Unbolt and remove the vent window assembly. Pull the regulator out of the holes in the inner door. The Compleat Official MGB notwithstanding, installation is NOT the reverse of disassembly! Replace the rubber door seal with a new one, again using short stainless 1/8 rivets. Cover it with 2 layers of masking tape. I then lubricated the tape with KY jelly. Place a new bottom seal on the vent assembly, insert it into the door and install bolts loosely. Fish the rear track into the door and put it in place but do not install any fasteners. Fish the door glass with metal track attached down past the rubber seal, taking care not to tear your new seal. Straight down worked best for me. Push the glass into the front track and then fish the rear track into place on the back of the glass. Install the rear track fasteners but do not tighten. Slide the door glass up and down in its tracks until it slides freely but is tight enough to stay in place when you let go of it. Some white lithium spray grease in the tracks helps. You may need to shim the rear track with washers to get the right degree of friction. When the glass slides properly, tighten the front vent assembly and rear track bolts. Check and adjust window friction as needed. Fish the regulator (still adjusted halfway between open and closed) into the door. Slide the roller pins on the regulator back into the metal channel on the bottom of the door glass. Front roller goes through the slot in the middle of the channel; rear roller goes into the back of the channel. Moving the window up and down as needed, (here it helps to have an assistant with non-greasy hands), maneuver the regulator so the winder knob attachment on the regulator goes up through the proper hole while making sure the roller pins don't fall out (this may take a few tries). Attach the winder knob, and turn the knob until the mounting holes for the regulator bolts come into alignment. Start one bolt by the winder and one bolt in the center of the door, and then add the rest. Tighten partway and check to see that window winds up and down without binding. Tighten all bolts and ensure the winder still moves freely. Fiddle as required. Lubricate all the moving parts with white lithium grease spray. You will probably need to fabricate some kind of pad on the door stop to replace the old horsehair pad. I used some scrap carpeting. Reinstall the plastic moisture barrier and door panels and be on your way! 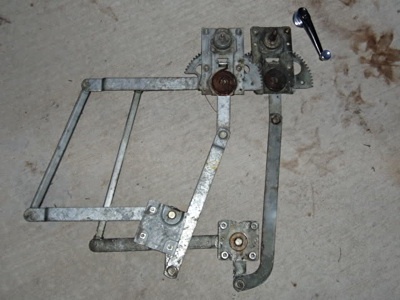 Comments on "Door Glass Removal and Installation"
A good "how to" however I found it better to install the window regulator first with just 1 bolt holding it firm at the handle bracket. I found that I could not get the regulator in with the quarterlight fitted...could not get the winder piece past the leg of the quarterlight. Good stuff and very helpful. Saved me a lot of experimenting, thanks very much for this article. I was able to fiddle the glass out without removing the vent window. Thanks, I think I can put the door together now, even though I didn't take it apart. protected and then lubed it with KY jelly. Good luck! I just did this yesterday, can be a nasty job (I didn't take it apart) but I did put the door latch's and control rods in after the glass, no problem. What holds the glass to the regulator? I'm just curious why the window can't be detached and slid out. The glass sits in a rubber gasket and that assembly sits in a metal channel. The regulator has to be removed from the glass and channel before it will come out. The glass and channel come out the top. The regulator comes out through the rear hole in the inner door. The glass and rubber is bonded tightly to the metal channel, but there is no need to remove the channel unless you are putting new glass in. Jack, thanks for the explanation. The question I was trying to ask is whether the glass can be separated from the regulator while it is still inside the door. In other words, can the glass, by itself, be removed through the top. And if so, how do you separate glass from the gasket that sits on the regulator? Excellent aid in helping me refurbish my door glass. Got both the vents and door window glass out. Now, can I get it back together with new glass? About to put new rubber, wipers and wing seals on. To be clear - does the regulator and glass have to come out on a 77B? Iam not clear about the removing the horsehair pad and dropping the glass "lower" in the door. It would be awesome if the glass didn't have to come out. I had tightened the vent window bolts first and now I have a large gap between the glass and the rear channel. Does the vent window assembly move towards the rear if I loosen the vent window bolts. I had to trim about 3/8 off the rubber seal at the top of the door before riveting in place. If I move the vent window to the rear, this will have to be removed and shortened more?
. . . and if you had purchased comprehensive car insurance, the time and materials for changing broken glass is paid for by the comprehensive insurance many times over. From 1983 until 2015, I have had 4 windshield hits from rocks kicked up by other cars. The cost is $0, with the comprehensive insurance at very low prices. I found step #2 on reinstallation of windows on my 64 rd confusing. What I had to do was loosen completely both the back track and the vent window assembly and pull it up to accomodate the regulator assembly ability after retrackiing the glass and then returning the regulator assembly toward the front in order to pass the front track...then I could lower the vent assembly into its' proper place and then tighten everything down...the vent, the regulator and both tracks. I wish someone would Youtube this whole proceedure before B owners go insane trying to make sense out of confusing instructions from 2008. Gary, I am sorry you found my instructions confusing. I still think they are better than what the shop manual provides, which is zilch. There are major differences between the 1974 door that this article is written on and your 1964 pull handle door. You may have missed my statement that "earlier or later cars may need a different approach". Jason, where did you get the new rubber? Sounds like it might be too stiff. Try Martin MacGregor - his rubber products are really good quality. any help out there for a window reinstallation of a 64 pull handle mgb? Pressure holds the glass. No glue. Brilliant.......after following some other "experts" with frustrating results, this technic worked like magic! Thanks Jack! This is an old post that still seems to have life! Must be a good one.But I don't understand the masking tape bit. Does that mean one sees masking tape on the rubber seal, instead of the seal itself? This seems like a dumb question, but perhaps someone has a picture that can help me.Thanks!